TIREE: 1 Snow Bunting at Sandaig, Ad Iceland Gull at Loch Earblaig, juv Glaucous Gull at Loch Bhasapol, 2 Gadwall, 1 Black-tailed Godwit and 4 Scaup at Loch a’ Phuill. Island totals of 125 Whooper Swans and 21 Pied Wagtails. (John Bowler). MID-ARGYLL: Our first report of a Willow Warbler – one in song yesterday in Minard – also a single Wheatear at Keills on the 18th (John McInally). Today – a Nuthatch back again in the garden today – nr Barsloisnoch farm (James lehmann). A Greenshank was at the head of Loch Feochan this morning (Jim Dickson). MID / NORTH ARGYLL: Highlights of my belated WeBS count on Loch Etive were a second winter Iceland Gull at Ardchattan Priory and a Grey Heron at Bonawe Quarry having its fishing interrupted by a female Otter with two cubs. The Norwegian-ringed Blackbird (see 17 January) is still visiting my garden in Connel most days but the change to westerly weather may encourage him to move on soon (Mike Harrison). 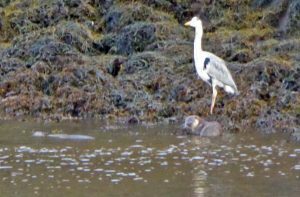 Heron and Otter – Bonawe, North Argyll 20th Mar (Mike Harrison).